RIYADH, Saudi Arabia --- King Abdulaziz City for Science and Technology (KACST) today unveiled in Riyadh the strategic drone program (Saqr-1). Prince Turki bin Saud bin Mohammed, President of King Abdulaziz City for Science and Technology (KACST), stressed the highly advanced techniques used in this aircraft. He stated that Saqr-1 is equipped with a KA-band satellite communication system that gives superiority and privilege to this aircraft. 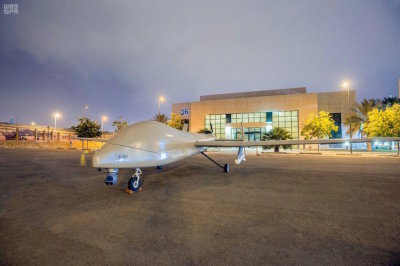 It can fly for a range of more than 2500 kilometers with the ability to carry missiles and guided bombs with laser system and launch from different heights from 500 to 6000 meters and a range of up to 10 km with an accuracy of less than 1.5 m.
The UAV is capable of flying at an average altitude of 20,000 feet and has a flight time of 24 hours.